You have to be politically correct in sports, too, so no one was about to bury the Boston Celtics. Other than Thursday on the scoreboard as the Bulls pretty much wrapped up the No. 1 playoff seed in the Eastern Conference with a convincing 97-81 win over the defending Eastern Conference champions. So everyone knows how it goes as you insert your yadda, yadda, yadda here. You’ve got to beat the champion. Everyone has to go through the defending champion. You cannot underestimate a team with three future Hall of Famers, four if Shaquille O’Neal were playing. Oh, right, this is not the same team without Shaq, though when last seen looked 49 years old not 39 and much closer to 400 pounds than 300. Never underestimate the heart of a champion and all that. But, sorry, it’s just difficult to see anymore with this Celtics team, especially the way the Bulls methodically put them away behind 30 points and eight assists from Derrick Rose, 23 points, with 18 in the second half, from Luol Deng and 14 points and 12 rebounds from Carlos Boozer with Joakim Noah still slowed some with a sprained ankle. So, yes, caution is appropriate when you haven’t exactly been threatening anyone in the playoffs, as this Bulls team hasn’t. But as Celtics coach Doc Rivers noted after the game, it isn’t a fluke when you are 58-20, leading the conference and, by the way, holding the Celtics to 79 and 81 points the last two times the teams met and under 40 percent shooting both times, including 38.4 percent Thursday. This isn’t the same Celtics team since the trade of Kendrick Perkins and Shaq mostly out of the lineup. Jermaine O’Neal started at center, played more than 16 minutes, and had the same number of rebounds I did. The Bulls hammered the Celtics on the boards even with Noah sitting the fourth quarter for Kurt Thomas, who looks to be the best Celtics center, though a backup for the Bulls. The Bulls had a whopping 44-22 edge in paint scoring, suggesting the Celtics didn’t want any part of the physical play, and even as the game was within three late in the third quarter, you always had the feeling the Bulls were in control. You are champion until you are not. Ali was the greatest, and then he couldn’t come out to finish against Larry Holmes. Joe Louis barely did against Jersey Joe Walcott, but he was done. It comes to the end for all of them, and though the Celtics will have some fight left in them, it’s difficult to see how this team with Kevin Garnett pushed away from the basket by the Bulls and Ray Allen repeatedly run off shots can have the offensive fire power and defensive tenacity to compete with a younger team like the Bulls. You’d never get anyone among the Bulls to suggest that, and it would be silly for them to as they haven’t done anything, as Boozer noted. 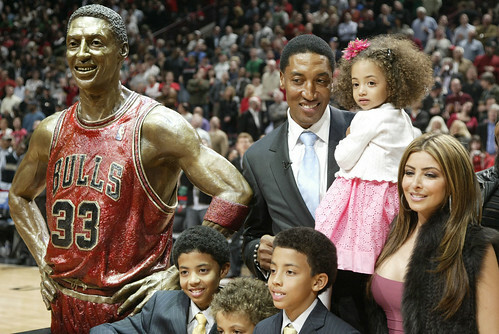 But you see cracks in this Celtics’ foundation, and it never was more obvious the way the Bulls played them. Rajon Rondo was dominated by Rose. Though Rose’s defense is often questioned, Rose is so quick he was able to play up on Rondo and cut off his passing lanes while most teams drop off Rondo because he cannot shoot and allow Rondo better views of the offense. Rondo finished with seven points, six assists and five rebounds, and by the end was running at Rose’s shots with his hands down in defeatist position. 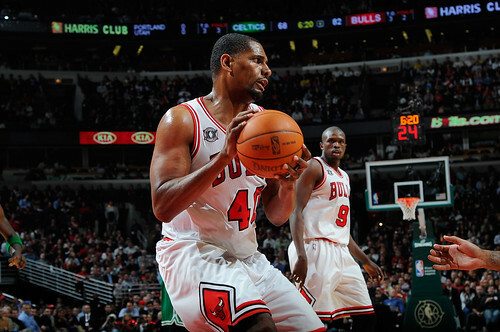 The Bulls’ defense on Paul Pierce and Ray Allen was solid and they stuck with the plan. Pierce likes to find the elbow jumper, so the Bulls chased him and the big men stepped out while Deng did a good job not falling for the pump fakes. First Keith Bogans and then Ronnie Brewer, perhaps more Brewer, chased Allen over those screens, barely giving him any room and pushing him toward help. Allen was just three of 11. Glen Davis was just one of eight shooting mostly fadeaways against bigger defenders. He became so rattled he got into a bit of a fracas with Kurt Thomas, no great idea as Thomas doesn’t back down from anyone. 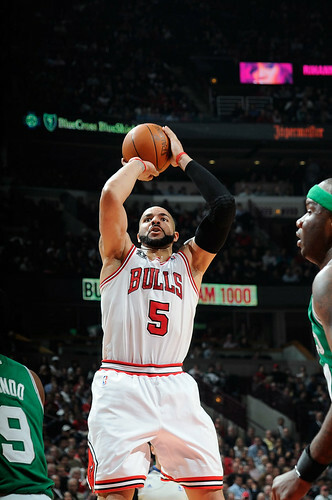 It came early in the fourth quarter as the Bulls were breaking open the game, turning a 71-60 lead entering the fourth into 80-65 when Rivers pulled Davis four minutes in. Davis began to lose it on the bench and had to be calmed by assistant coaches. Rivers doesn’t pull any punches with the media, relatively rare for NBA coaches, and though he said before the game no matter who won he liked his team’s chances, he agreed Thursday was no contest. “I thought they were far more physical, tougher, more prepared, which is on me,” said Rivers. 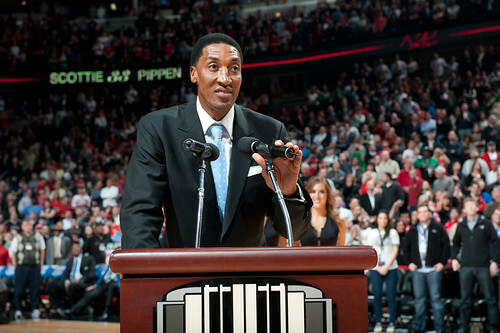 “I thought Thibs did a better job. 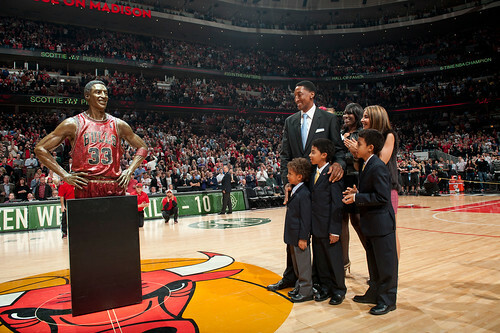 I thought Boozer did a better job, I thought Derrick Rose did a better job. Heck, I enjoyed watching them play. I thought everything they did was better. Their offense was better than our defense. Their defense was better than our offense. Every loose ball they got to, every tough play. I thought we reacted all night. We were never the instigator. 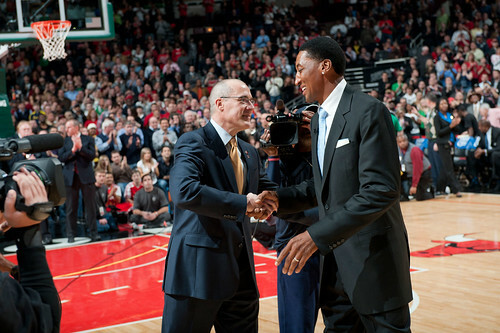 “It’s no coincidence the Bulls have the best record,” said Rivers. “They earned it. With heart, with the way they play. I told the guys that before the game. You don’t play this amount of games and have the record they have and think it’s something different. They earned it. I thought every single one of those guys was focused and played hard. I thought we played in spurts. We were front running. We’d make a little run coming out after halftime and I see the guys jumping around and puffing their chests out and they make a run and we hung our heads. I thought they were tougher in every way. Maybe this was about a veteran team pacing itself and knowing after two uneven months last season they could get to the Finals. 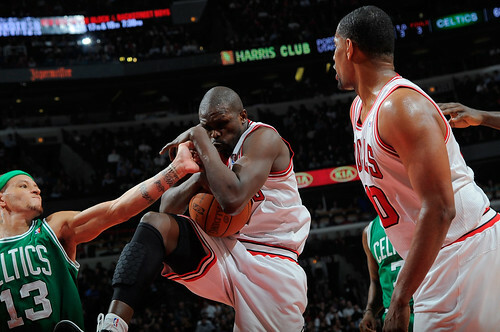 But when Rose broke down Rondo on the outside, Garnett wasn’t even close to helping. Garnett was eying him from 12 feet away and still couldn’t get there with an angle. That’s hardly the anchor of the defense the Celtics had. 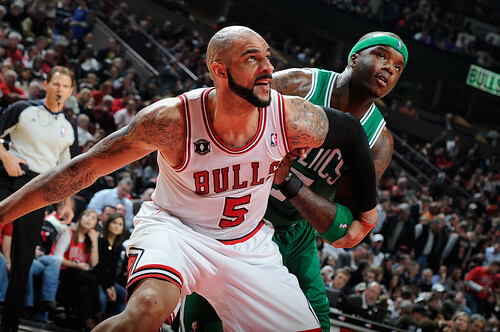 Boozer was able to power up shots, which he has trouble doing against bigger players. 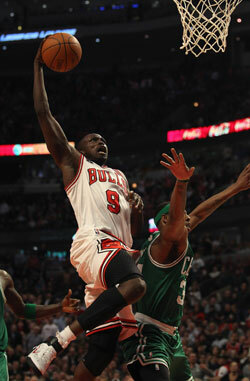 But the Celtics had smaller guys, and even Jeff Green, whom Boozer practically trampled backing him down a few times. 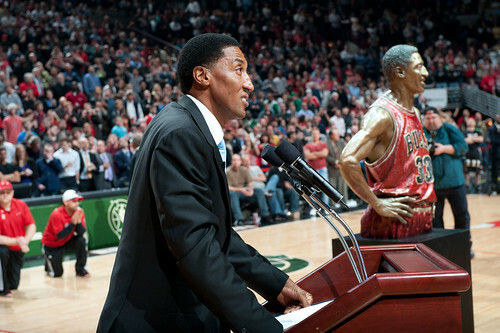 But, no, it wasn’t a particularly giddy Bulls locker room, not like it might have been before dominating the Celtics. 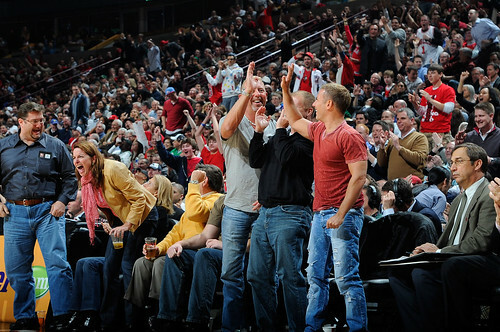 The Bulls continue to show that, and it being a national TNT game with only two games being played it’s something of the NBA’s version of Monday Night Football. The league watches. Rose was brilliant again. And again, and again. He came ready with 10 points in the first quarter, something the coaches have been urging him to do. He had a runout slam dunk after a Pierce turnover and closed a 26-18 first quarter with a ‘where’d he go’, ankle breaking crossover past Rondo and through Green and Nenad Krstic at the rim. Really, you can’t be serious playing Green and Krstic and trying to be tough. I personally think that trade is the fatal blow for the Celtics. It’s not about Perkins averaging four or five points. He emboldens Garnett, who doesn’t generally want any part of contact and was very quiet without Perkins to back him up. Krstic is a finesse player and Jeff Green was out of position so many times on defense he may have well been watching. Green does have some favorable matchups on offense, and he gave Boozer some issues early in the second quarter as Boston got within 35-31 midway through. But Green couldn’t handle Boozer in the post, and when on quicker players Green kept getting lost and leaving shooters open. He, frankly, looked awful and seemed to have little impact. Which all negates Garnett, who needs toughness and size around him. Thus all this for Boston seems to depend on the aging, breaking down Shaq. It’s a head shaker to think they’ll have Shaq for even 18 to 20 minutes per game. Heck, I think Omer Asik, who seems to be falling out of Thibodeau’s tightening rotation, would be the Celtics best defensive center. You can see that Thibodeau is closing down the rotation a bit getting ready for the playoffs with Asik likely on the outside after playing five minutes and C.J. Watson eight minutes. Thibodeau said Noah is fine, which generally means he has no exposed bones. Taj Gibson has been playing well in relief of Boozer, but my guess is Thibodeau begins to reduce minutes for Bogans, Brewer or Kyle Korver depending on who is going well and play more a playoff eight-man rotation. Thibodeau, of course, called the Cavs game Friday the biggest of the season because it is next. 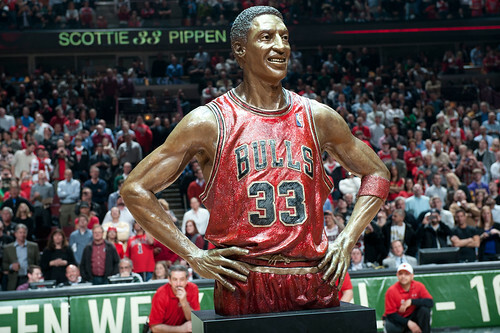 But should the Bulls actually beat the league’s worst team, they’d clinch the No. 1 seed heading into Orlando Sunday, where Dwight Howard and Quentin Richardson are suspended and not playing. The Bulls close the trip in New York, whom they have yet to beat this season. So I don’t see Thibodeau giving that one up, and then return home next Wednesday to close the regular season against the Nets. I don’t see Thibodeau cutting back playing time much, or at all, and Deng, for one, says he’s fine with that even leading the team in minutes played. After Boston closed midway through that second quarter, Rose again blew by Rondo and Garnett couldn’t come close at the rim on help, which is something you never saw in previous years. He is slowing, and why not. He’s 35 next month, had knee surgery and in his 15th season. Sometimes a defensive anchor just begins to sink. And this was no meaningless game for Boston with potential second round home court against Miami at stake, and given the Celtics still believe they are Eastern favorites—OK, I don’t think they care that I don’t—they have been eying the Lakers record for Finals home court. 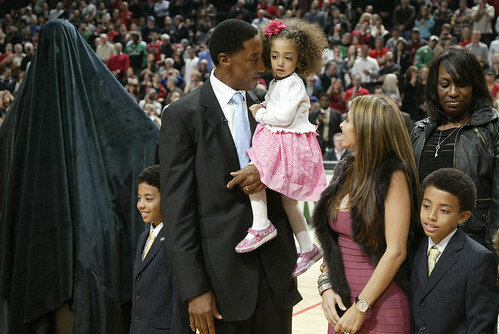 So as Garnett acknowledged it was big for them as well. 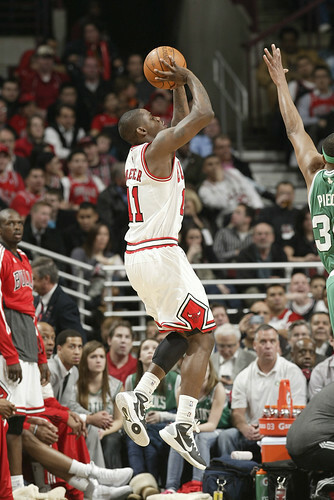 Garnett after a scoreless first quarter began to make his jump shot, which still is solid. But he doesn’t have those big scoring games anymore and had 10 in 30 minutes. In fact, through three quarters no Celtic had more than 10 points. Deng hit a three off Rose penetration with the Celts still slow to rotate and Ronnie Brewer, coming in for the foul plagued Deng, knocked in an 18 footer to make it 46-39. Brewer has been much more aggressive with his jumper of late, and, at least early, Noah was more active on the boards and Boozer closed the first half for the Bulls with a tip in of a Rose miss for a 48-43 lead. 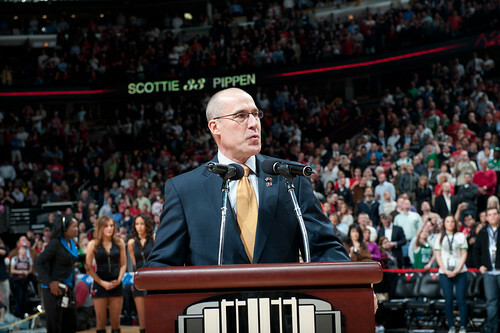 It was somewhat deceptive, if perhaps worrisome for the Bulls, who seemed to be playing much better. The Celts spurted briefly after halftime as Rondo went at Rose for a pair of scores as the Celtics began to push the ball some. But Rose and Deng responded with driving scores and a runout and jumper from Deng for a 60-51 lead midway through the third. This also is where Thibodeau is so good and why there’s so little complacency with the Bulls. First on a Rose drive and miss, Bogans didn’t get back. It’s the opposite guard’s responsibility for so called floor balance to cover for the other guard if he’s below the free throw line on offense. Rondo scored. Then Bogans missed a deep corner three and Allen scored to draw Boston within 60-56. 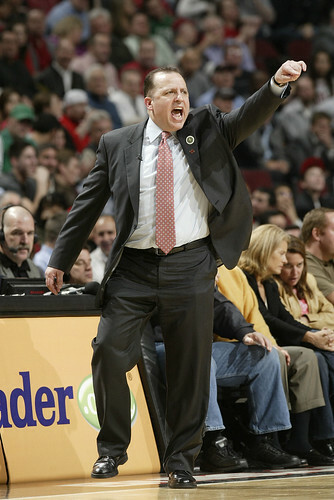 Thibodeau called timeout and got into Rose and sat Bogans for Brewer. The Bulls came back with a rush to close the third with a nice Deng inside feed to Boozer and Rose three for an 11-4 run and 71-60 lead after three. 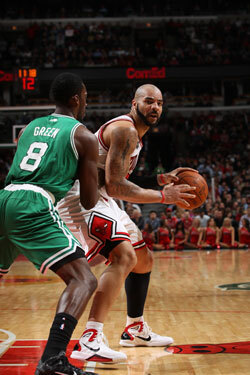 Boozer basted Green opening the fourth, Kurt Thomas hung a big shadow and big body on Garnett he didn’t appear to like, and when Rose hit a three with 5:03 left for an 85-68 lead, it was about over. 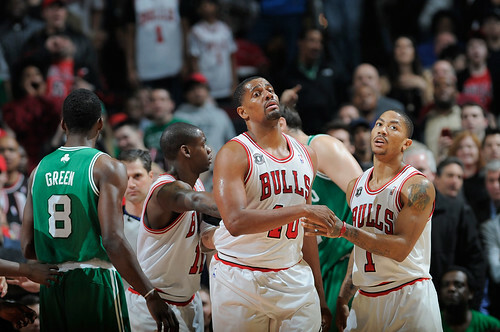 Still, the Bulls pretty much played their starters all the way even after Boston emptied its bench. Thibs doesn’t kid around. The Bulls won for the 17th time in the last 19 and ended recent efforts when the defense faded after halftime and the rebounding was indifferent. It was the way a team needs to play as the games grow in importance.